Our design consultants are just one of the things that makes your Kermans experience better. We offer design assistance, estimates and measures at no additional charge. 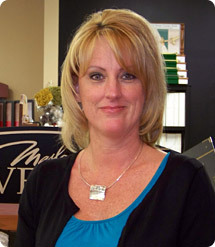 Lori has been employed with Kermans since 2003 as a sales design consultant in our Retail Department. Over the years, she has enjoyed a wide range of responsibilities and appreciates being engaged with all the facets involved in serving our customers. Lori's day might involve working on the flooring activities of new home contractors or with exclusive designers, as well as fulfilling the needs of our daily customers. Lori says, "When you walk in our door you can tell that Kermans is different from other carpet stores. It's a family-run and operated business and that really makes a difference for our customers - and for me. I love my job; I get to help customers and work with a great group of people every day." When Lori isn't working you can often find her on the sidelines – watching her son play sports or her daughter cheer. That’s the Kermans’ Experience – unparalleled service and knowledge backs up every sale. Whether you are carpeting a mansion or looking for an area rug for your first home, you’ll experience the same attention, care and exceptional result. Learn more about Kermans. Don't just take our word for it, visit our showroom on Indianapolis' northside - designed with interior design in mind. When you get there ask to speak to one of our design consultants, they'll be happy to share with you how they've helped families in Greenwood, Geist, Carmel and all over Central Indiana.